Over 12 months ago, Google launched a mobile feature named skip redirect. It basically does that it means. If you have a mobile version of a web site and Google knows about it, Google will automatically bypass any redirect you may have and send the mobile user to that version instead of passing them through a redirect. A Google Webmaster Help thread has one webmaster not happy about it. He said, he wants mobile users to first to go to his non-mobile web site and then go to the mobile version. Why? He said the "first impression" users get from the desktop version is better and then they can go to the mobile version. The last time Googlebot-Mobile for Smartphones crawled your site's homepage at http://strandedtreasures.com/ , the server returned a 302 redirect to http://strandedtreasures.com/m/ . In our search results for smartphone users, we sometimes help users access your site faster by giving them the destination of such redirects as the search results. This feature, called Skip Redirect, can save users about 1 second when they're on a mobile network. So if the redirect was not there, then Google would not likely list the mobile version. 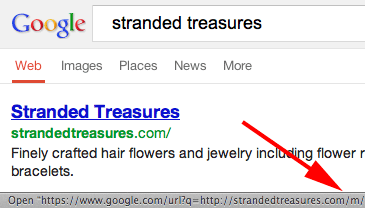 Only because of the redirect is Google listing this.